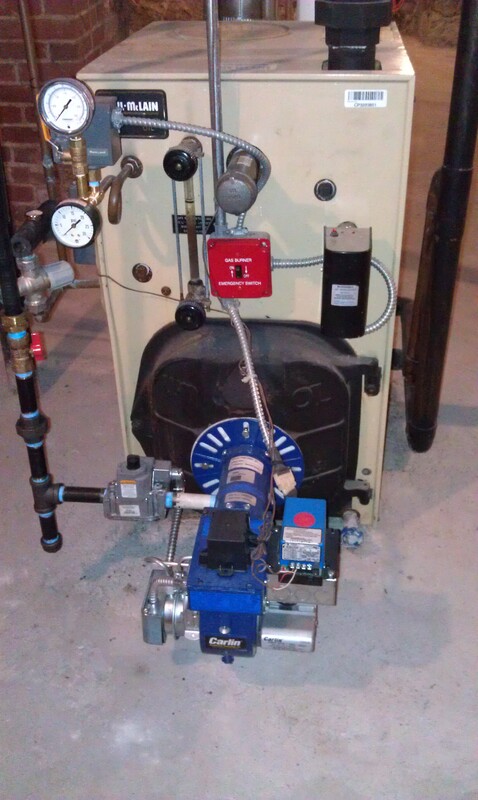 I had my Weil-McLain Gold boiler converted from oil to gas last month using a Carlin EZ-Gas burner. It's running the steam heat nicely, but I've noted that the performance of the tankless coil for hot water has changed. A shower cools down noticeably after about 5 minutes, stays cool for a couple of minutes (not cold, but the shower is turned up all the way and I'd like it a bit hotter), and then warms back up. There were subtle temp swings before with the oil burner, but it never cooled enough to max out the shower valve. Any thoughts on why the operation of the coil has changed, and how to get it back to working like before? I wonder if the gas burner takes longer to come on when called and this allows the coil temps to drop. If you now have gas why do you still use the tankless? You would be better off using a gas fired water heater and stop using the tankless all together. I doubt it's the mixing valve as the temps were fine the day before the gas conversion, and not the day after. It would be a rare coincidence for the valve to fail the same day as other work was performed (the water piping was not worked on), though I can't rule that out yet. I do plan to put in a gas fired tank someday, but it wasn't in the budget for this year. The gas pipe size would need to be increased to handle that second appliance, and I couldn't justify the expense - I don't plan to be in the house for 10+ years, so the slight extra cost of running the boiler for hot water is OK for now, as long as I can actually get hot water again. I've currently got a temp gauge on the outlet of the mixing valve, and I'm going to add one on the tankless coil outlet tonight so I can better tell what's going on. also the inlet valve to the tankless may have been throttled down to reduce flow rate and while working there it may have been opened wide. The only reason a new burner would change the perfomance would be if it was not properly sized and or tuned. Did the installer use a combustion analyzer and give to a printout of the final readings? There's no valve, cold water flows freely into the boiler's tankless coil and then comes out hot and goes to the mixing valve. I don't have a photo of the coil side of the boiler handy, but I can take one tonight or this weekend and post it. The installer did a combustion analysis - I think I've got the printout at home by the boiler. My recollection is that the EZ-Gas may be tuned for just a tiny bit less output than the oil burner was based on available orifice size (I think it's set up for 125,000 Btu/hr), so that may be part of the puzzle. I spoke with the installer yesterday and he thinks it's also that the oil burner came on instantly when called, where the gas turns on the blower for a while before actually lighting the burner. Is that delay adjustable on an EZ-Gas? Below are pics as promised. First two show the piping to the tankless coil and mixing valve from different perspectives (cold inlet comes down in front of the aquastat), the last is the boiler overall. Looks like a real nice job. The money you save this winter should more than pay for a new water heater this spring. From there on you will just continue to save money and make the system more desirable when you do sell. the btu input is the input. That is why we use a standard measure system. 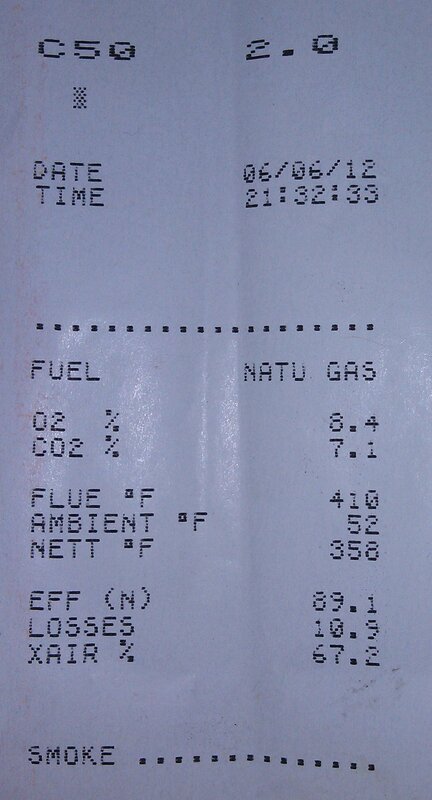 89% with that co2 reading? really? 89% on a steam boiler? something is not quite right with that printout. The boiler only can get 86.5% when firing oil. Gas numbers on oil equipment usually fall a few points lower. If it is that high you now need to worry about condensation in the cast iron boiler and the flue. The boiler is under fired too much, that is the issue. The mixer is not installed according to the manufacturers instructions. There is no heat trap.The pre-purge is killing it. Put a storage tank on it and your problems will be solved. The hot water demand is greater than the heating load. This is under fired. Great #'s, poor recovery. Also, can't tell if your water level is above the coil from the pics. Where is the aquastat set? Is the lack of heat trap affecting the hot water delivery, or is that just about extending the life of the valve? I did call Carlin and there is a shorter pre-purge version of the EZGas control (used OEM on Smith boilers) that reduces pre-purge from 30 to 10 seconds. Think that would help? I think the water level is OK (but tell me if I'm wrong!). It's where the black Sharpie mark is on the sight glass, about halfway between the black label and the upper end of the sight glass. getting through due to lack of a heat trap? how long for valve to react? How long should it take for a mixing valve (Honeywell AM-1) to react? I think we're onto something with the trap. I ran the boiler for steam this afternoon (so the tankless coil got hotter than aquastat setting), and after leaving it for a while had temps around 175F in the line going from tankless to the mixing valve, and 135F on the gauge that's in the mixed line about a foot up from the valve. With the kitchen faucet on hot, it took 2-3 minutes for the mixed temp coming from the valve to drop 15 degrees, delivering some seriously hot water to the faucet in the meantime. Is that abnormal? I wonder if in addition to piping in a heat trap I need to replace the valve too? Is there one in the system? No recirc pump. Flow only with a faucet open. The mixer shouldn't have any bearing on the hot water without the heat trap. I've seen them go quickly without them. The numbers you post seem to me that you need to raise the operating temperature in the boiler because you need more latent heat stored and available for the coil to get transferred from. If the boiler can't maintain the heat, then it is under fired for the hot water in my opinion and worth nothing. With all the hot water boilers with tank-less heaters and no storage tanks I ever saw, the operating temperature was usually set at a minimum of 180 degrees. Much lower and you could never catch up. Try raising the operating temperature setting at 180 degrees and see what happens. I have the aquastat at 183 F, though of course don't really know how accurate that setting is. On the Weil-Mclain drawing for piping a tank-less heater coil, there is also shown a "Flow Control" device that will limit the flow through the coil. I don't see one in the picture or mention of one. I am asked to look at problem installations. I was recently at one where a boiler had been replaced. 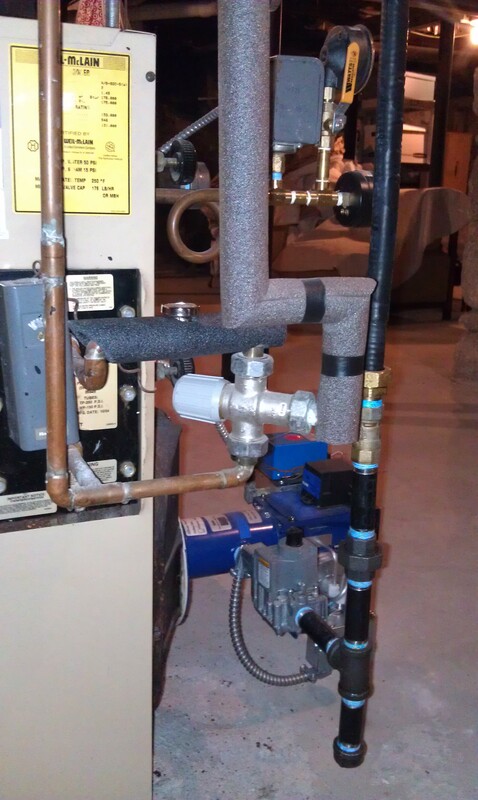 A Weil McLain WTGO-3 was installed and there wasn't much hot water. The problem was a lack of flow control. I could prove it by slowing down the flow through the coil. The temperature would go up. 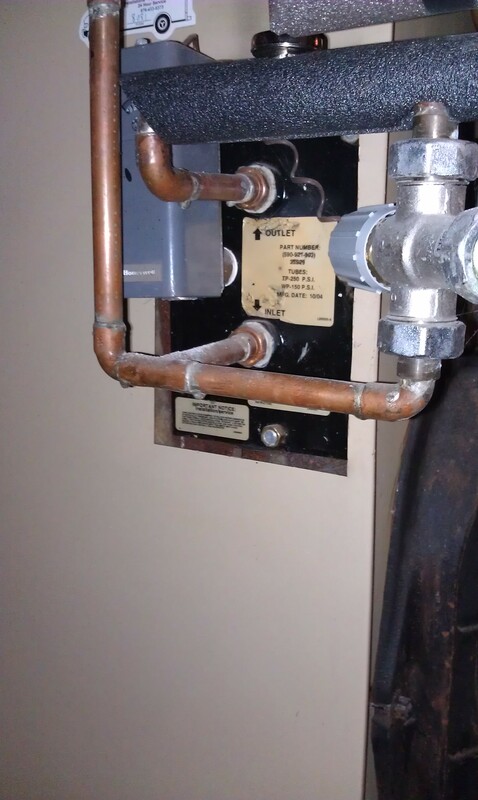 Back when, during the Pleistocene era, my old boss always had us install a Stop & Waste valve on the cold water inlet to the mixer so if you burned out the thermostatic element, you could close the valve and get hot water. Also, that valve will pass a certain amount of cold water no matter what. That small amount of cold water will effect the outlet temperature. If the coil is rated at 2.5 GPM, you need a 2.5 GPM flow control valve installed. WTGO-3 boilers are not noted for stellar tank-less performance unless a storage tank is used. Buy a 40 or 50 gallon electric water heater, the cheapest one you can find and connect it through the tank-less with a circulator. You will solve all your problems. It is a very cheap date. I've done them for years. In spite of what some may think. I have a WTGO-3 oil with a 50 gallon storage tank. I can start the dishwasher, start the washing machine, go up and take a shower, and my wife can come in and when I am done in the shower, take a shower right away and not run out of hot water. And that isn't an exaggeration. Nope, there's no flow control. There is a gate valve a few feet upstream, but that would throttle flow to the cold side of the mixing valve too so wouldn't achieve the desired results I don't think. Might be able to raise temps that way, but at the expense of total flow. I'll have to check my showerhead GPM and compare to the coil rating and see if I'm pulling more than the coil is rated for. A flow control, an isolation valve, and the proper fire rating will do wonders. If your system would be over fired at the proper rate for that boiler then you need to invest in a tank. Every coil manufacturer requires a flow limiting device to give the rated output of the coil. You can't put 10# of $chitt in a 5# bag, you can't get 6 GPM put of a 4 GPM coil, no matter how hard you try. The only solution is "Peak Shaving" or collecting and saving hot water for later use. In other words, a storage tank.